We will present a form into which a visitor will type a stock ticker symbol. The visitor will then click a button to get the stock price. The page will call to the Google Apps Script web app to get the stock price, and display this in an alert to the visitor. In this way you'll see how parameters can be passed to and responses captured from a web service. Now you need to publish the web app, so click Publish and Deploy as web app. You'll need to save a new version from the dialog that appears. And in the field "Who has access to the app" make sure to select "Anyone, even anonymous". Once you've published it, make a copy of the web app URL, because you'll need that when we edit the page on Blogger. At this point you can test the web app by pasting the URL into your browser bar and appending "?ticker=TDC" to the end. You should get a response something like the following (with a lot more info). That's it. Now visit the page or post that you just created in your browser and type a ticker symbol like TDC into the form and press Get Info. In a few moments you should see an alert popup with the current price. 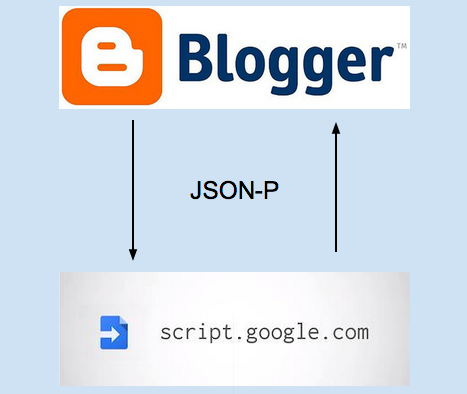 It's also worth mentioning that the more typical approach with JSON-P is for the calling page to pass the name of the callback function to the web app, and for the web app to use it. In the example above I hardcoded the name of the callback function to just simplify things a little. I have implemented in my blogger contact form. Google reCaptcha..